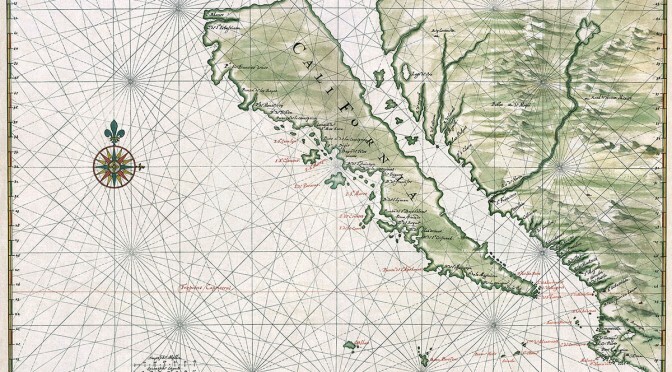 An early map of California by Joan Vinckeboons, an employee of the Dutch West India Company. 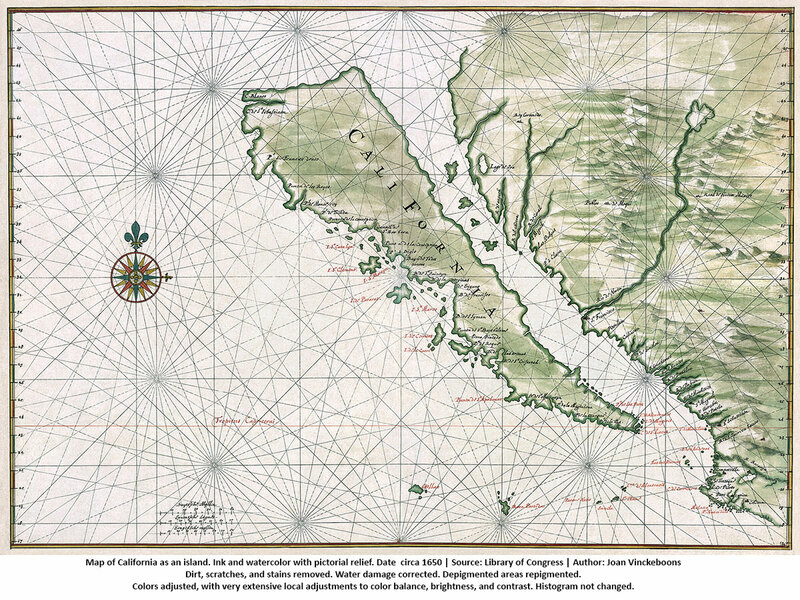 The geography of the West Coast, and particularly the Baja peninsula, contributed to an early European misconception, from the 16th century onward, that California was an island. This myth was debunked in the 18th century. Map of California as an island. Ink and watercolor with pictorial relief. Date circa 1650 | Source: Library of Congress | Author: Joan Vinckeboons Dirt, scratches, and stains removed. Water damage corrected. Depigmented areas repigmented. Colors adjusted, with very extensive local adjustments to color balance, brightness, and contrast. Histogram not changed. He directed and oversaw the building of new missions, aqueducts, embankments, drainage channels, and the first silver mines. He died at San Ignacio in 1759. 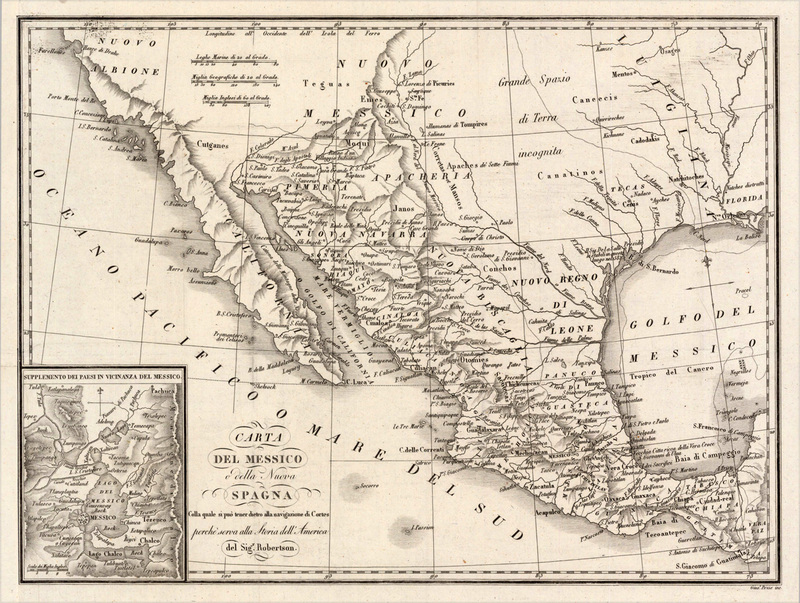 On the basis of the data obtained, Konščak made a precise map of Baja California (1748) and a map of the Gulf of California (around 1750). In June and July 1746 he was sent by sea to the head of the Gulf of California in order to investigate the disputed question of whether Baja California was an island. Although he closely followed the coast and reached the Colorado River, the issue continued to be in dispute for nearly another three decades . There is an outcrop in the northern Gulf of California named Roca Consag, located offshore near San Felipe. Konščak discovered many water springs so that even today there are shops and other facilities in California bearing his name like “Licores Konsag”. The above “Baja Island” correction furnished by one of our knowledgeable readers, a Croatian / Mexican, courtesy of The Latitude 22 Road House.